This +16 hotel is located right in the centre of Benidorm. Within 900 meters you will find the fine white sand beach of Levante, which invites for a refreshing sunbathing. But you do not have to go that far, since the hotel's own swimming pool creates an relaxing atmosphere with lots of palm tress surrounding the pool area as well. Refresh yourself at the pool side bar whenever you feel like it. The SPA area offers jacuzzi and health and beauty treatments. Lay back and enjoy this adults only hotel and start enjoying your holiday. 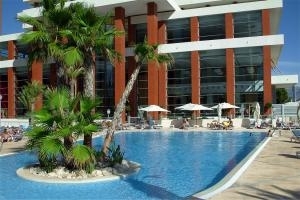 The Adults Only Barceló Estepona Thalasso Spa Hotel is just 600m from the beach located, at the Costa del Sol, in Spain. Thanks to the great location, clients can enjoy first class golf experiences in the close by golf courses. Enjoy a fully relaxing holiday with your couple at the biggest SPA center in whole Andalucia, on more than 2.000 m2 with 35 treatment cabins and the most innovative health and beauty services. All rooms of the 4-star hotel are modern designed and newly renovated, offering faltscreen TV, bathrobe, slippers and free toiletries. You can choose between standard, deluxe or Junior Suites. Even the gastronomy is special at this adults only hotel, providing the special Barceló Healthy Gourmet, a carefully prepared gourmet menu that combines nutritional medical criteria with the most sophisticated gastronomy. Come, enjoy, relax and experience a holiday without children! This luxurious adults-only resort is situated opposite Jandía Beach in Fuerteventura, with an outdoor pool and hot tub. Guests can access all facilities at the nearby Jandía Mar and Jandía Playa. All rooms of the Barcelo Jandia Club Premium boast a terrace or balcony, tasteful decoration in neutral tones and dark wood furniture, free internet connection and private bathroom. Enjoy a huge buffet breakfast and great lunch service at the Atlántico Club Bar of Jandía Club Premium. À la carte dinners is served in the El Rincón de Jandía restaurant. 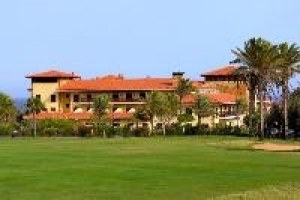 Located in the middle of the Fuerteventura Golf Resort, the Elba Palace Golf Hotel is also the Club House of the Golf Course and just the right spot for couples who look for a quiet holiday. All the rooms offer free Wifi, air conditioning, dvd player, television and a furnished balcony overlooking the green outdoor. Sourrounded by palm trees and traditional Canarian architecture, golf and sport fans will find all they are looking for in this adults only hotel on Fuerteventura.